Bldup - JM Electrical Company, Inc. The Massachusetts Building Congress (MBC) recently named Matthew Guarracino, Business Development Manager at JM Electrical Company, as President for the 2018-2019 session at the organization’s annual awards gala. The celebration, which honored John B. Hynes III, CEO and Managing Partner of Boston Global Investors with the association’s Skyline Award for Outstanding Achievement, was held at the Mandarin Oriental Hotel in Boston. "Matthew Guarracino is a thoughtful leader who brings his unique expertise to the role of president of the MBC," said Jan Breed, MBC executive director. 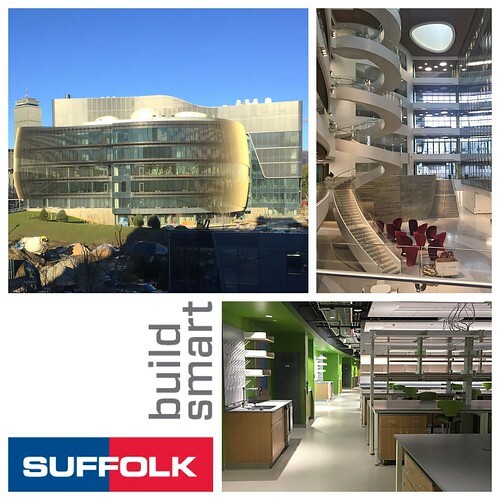 "His background and knowledge of the Massachusetts building industry and his ability to connect and collaborate with our membership including architects, engineers, and contractors is impressive. We look forward to working with Matthew throughout the coming year." In his senior role at JM Electrical Company, Guarracino directs the company’s business development strategy while also managing its financial and marketing efforts. 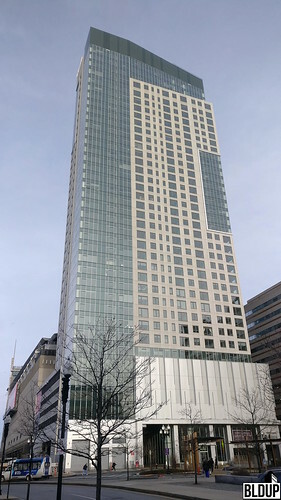 Pierce Boston, a 30-story, 378-foot-tall tower that is Massachusetts’ tallest tower west of the Back Bay, officially opened to residents in the beginning of March and has lived up to the hype. 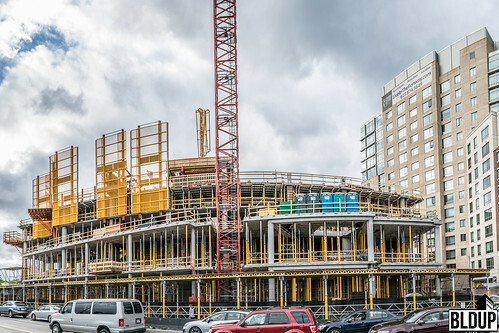 The building features 109 condominium residences, 240 apartment residences and over 20,000 square-feet of dining and retail space across its’ first two floors. 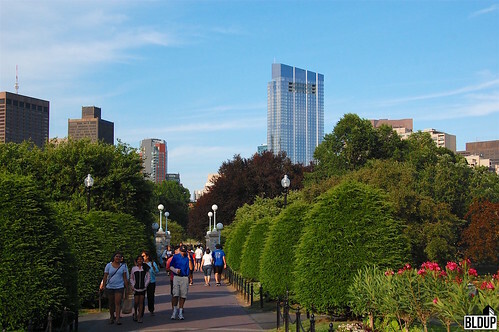 The tower is located in the heart of the growing, active Fenway neighborhood, and features sweeping views of the surrounding cityscape. Packed with amenities, Pierce Boston is part of a massive transformation in The Fenway. What was once considered a more affordable area of the city is becoming a highly developed urban epicenter and one of Boston’s best neighborhoods. 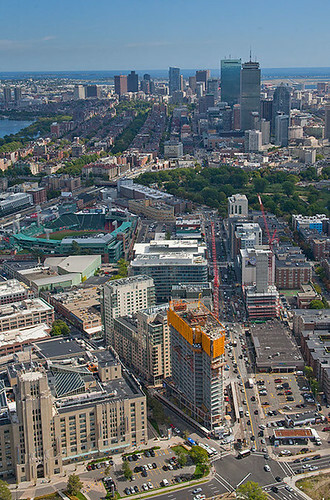 Luxury residences are continuing to appear in The Fenway with Pierce Boston leading the way. The project completion date remains on schedule for late 2018 using Touchplan, a construction software that allows developers to plan, implement, and monitor projects in their entirety. The innovative software gives developers the ability to see the full spectrum of their project down to every last detail. Touchplan has let developers keep their projects on or ahead of time leading to lower costs and more efficient construction. Related Beal, the developer of Lovejoy Wharf, has mortgaged the property via Deutsche Bank USA for $125 million. The development features 160 North Washington Street, the completed redevelopment of the historic Hoffman Building into 214,000 square feet of office space housing the headquarters of the Converse footwear company. The property also features 100 Lovejoy Wharf, a 157-residence, 15-story, 250,000 square foot luxury condominium building with ground-floor retail space. Everett-based, Night Shift, a locally loved and award-winning micro-brewery plans on opening a second location under the Converse Building at Lovejoy Wharf. As the North Station area continues to boom, with the Hub on Causeway and multiple mixed-use developments in the area, the brewery will be a welcomed addition. The upcoming brewpub will amass 12,000 square-feet of space at 1 Lovejoy Wharf and hopes that the additional location can continue to help establish them as a Boston brand. Seating will accommodate about 300 people and weather pending, people will have access to a waterfront patio that overlooks the Harborwalk Night Shift is excited about is the transit-oriented location, being right next to North Station and the MBTA. According to Eater Boston, Night Shift’s production manager Anna Jobe will manage the Lovejoy brewery’s 10-barrel brewing system, which has a capacity of about 2,500 barrels per year. The taproom is set to have 30 draft lines with the majority of the beers brewed on-site and only poured out of the Lovejoy facility. Apartments are located up to floor 18, and condominiums are located on floors 19 through 29 underneath the 30th floor Levity Lounge, a space exclusive to condominium owners that will include a private dining room, a library, expansive outdoor and indoor seating areas, private sky cabanas for purchase and a sky top pool. Nathálie, a wine bar by the team behind Downtown Crossing’s Haley.Henry, will open on Pierce Boston’s ground floor this Summer. As of the end of 2017, 70% of Pierce Boston condominiums have been sold, and 20% of apartments have been leased. 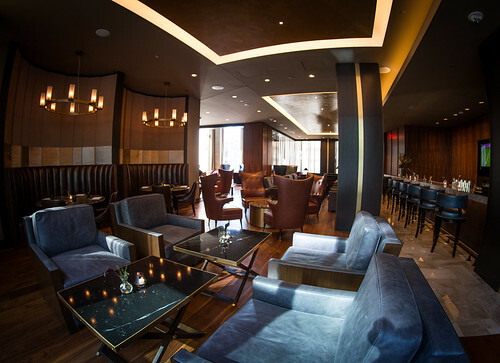 The proponents of Downtown Crossing’s haley.henry wine bar, located on the ground floor of the 45 Province condominium tower, will open a second wine bar dubbed nathálie on the ground floor of the new 30-story Pierce Boston, the Fenway neighborhood’s tallest tower. Between 50 and 60 wines will be served at nathálie, emphasizing female wine producers and old world varieties, per Eater Boston. Fit out of the 1,200-square-foot space, which will also include a 200-square-foot outdoor patio, is expected to commence in March. nathálie is expected to open this Summer, and will feature a variety of seating options including a bar, high-tops along windows, a lounge area and banquette seating. “Where haley.henry is a very masculine, tinned fish/wine bar, nathálie will be the dynamic, invigorating daughter that brings a whole new twist to Fenway,” said haley.henry and nathálie owner Haley Fortier in a prepared statement. “We are very much looking forward to establishing some amazing relationships by providing a unique wine bar experience for this part of the city.” Pierce Boston is set to open in February, and features residences including 109 condominiums and 240 apartments as well as 30,000 square feet of exclusive retail across the first two floors. 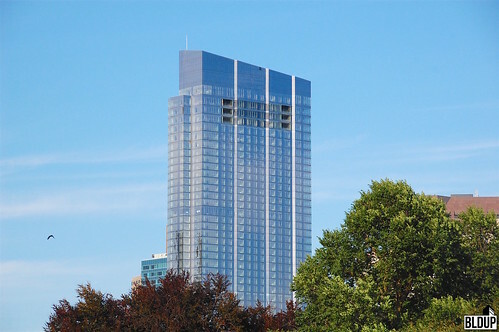 At the top of the tower is a Levity Lounge exclusive to condominium owners, which includes the highest situated outdoor pool in the City of Boston. The 30-story Pierce Boston mixed-use tower’s 109 condominiums are 60%-sold, and leasing of the tower’s 240 apartments has now begun in advance of Pierce Boston’s opening in early 2018. Rents for studio apartments start at over $2,900 per month, one-bedrooms start at over $3,000 per month, two-bedrooms start at $4,600 per month and three-bedrooms start at over $7,000 per month. Apartments are located across floors three through 18 of Pierce Boston, and condominiums are located across floors 19 through 29. On Pierce Boston’s 30th floor is a Levity Lounge featuring a pool, a library, a fitness center and a private dining room exclusive to condominium owners. Across the tower’s first two floors will be 30,000 square feet of exclusive retail. 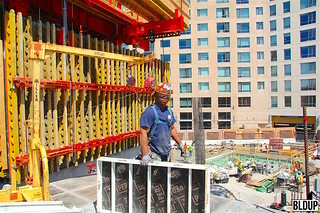 Interior finishing at Pierce Boston, the Fenway neighborhood’s tallest tower, is well underway, with luxurious finishes taking shape in the 30-story tower’s apartments, condominiums and exclusive amenity spaces, and JM Electrical hard at work installing a state-of-the-art HVAC control system that will enable advanced climate control in all residences and common spaces. 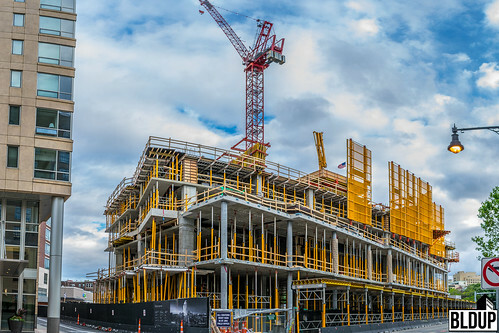 JM Electrical’s HVAC system will maintain precise temperature and humidity levels throughout Pierce Boston, ensuring residents of the building’s luxurious homes will be able to uphold ideal climate conditions as well as optimizing the building’s ventilation and energy-efficiency. 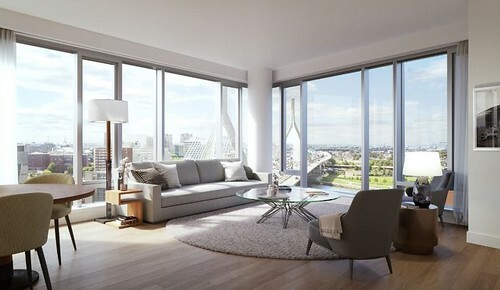 Construction operations at 100 Lovejoy Wharf, a new 157-residence waterfront luxury condominium building in Bulfinch Triangle, are complete, and residences are now on sale. 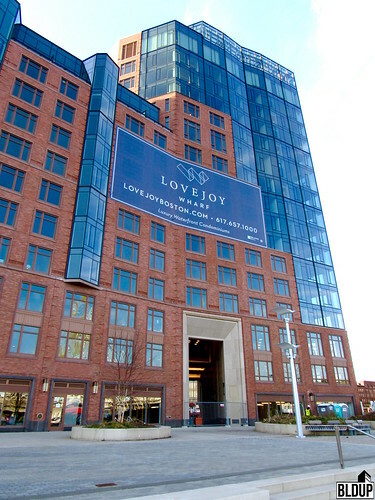 JM Electrical Company, Inc. has put the finishing touches upon 100 Lovejoy Wharf, installing a complete building automation system. Residences at Lovejoy Wharf will feature advanced in-unit HVAC controls, tailoring to residents’ specific needs and ensuring utmost comfort. 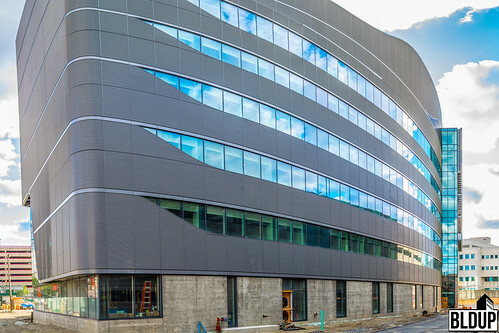 The building’s state-of-the-art automation system will control heating ventilation and air conditioning across the new building, ensuring top-notch energy-efficiency. 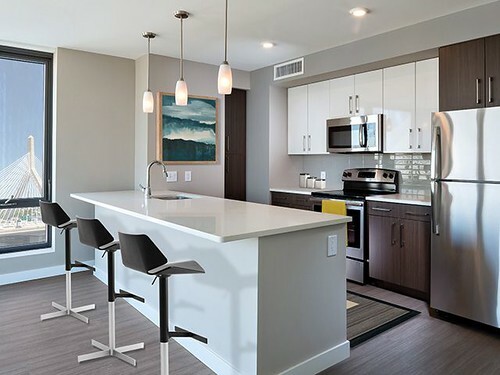 Amenities at the now-complete Lovejoy Wharf condominium building include a private 12th floor terrace with sweeping views, a spacious wharfside health and wellness space, resident lounge space, a business center and more. Residences are now on sale, ranging from a 10th floor, 750-square foot 1-bedroom/1-bathroom residence offered for $915,000 ($1,220 per square foot; $915,000 per bedroom) to a 5th floor, 1,601-square-foot 3-bedroom/3-bathroom residence offered for $2.6 million ($1,623.99 per square foot; $866,666.67 per bedroom). New renderings, posted above, have been revealed of Lovejoy Wharf’s stunningly luxurious interior spaces. 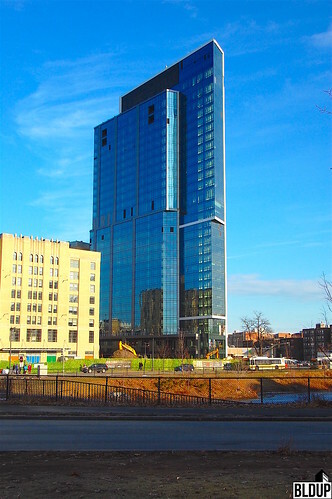 Unitized glass curtain wall panels have reached the 21st level of Pierce Boston, an exceptional new 30-story luxury tower in the Fenway. With an unparalleled vantage point as the Fenway’s gateway structure and tallest tower, Pierce Boston offers unparalleled views of the Boston skyline, the Charles River, the Emerald Necklace and the surrounding countryside. 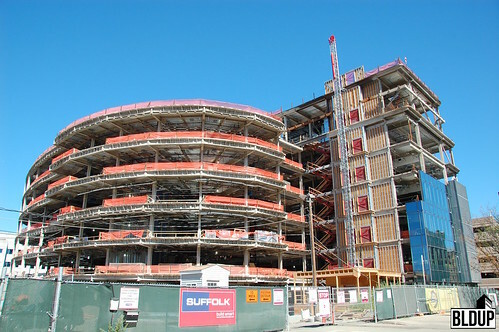 Levels 21 through 30 of Pierce Boston are actively being prepared for curtain wall panel installation. Metal panel anchors, which are used to fasten curtain wall panels, have been installed as high as Level 26. 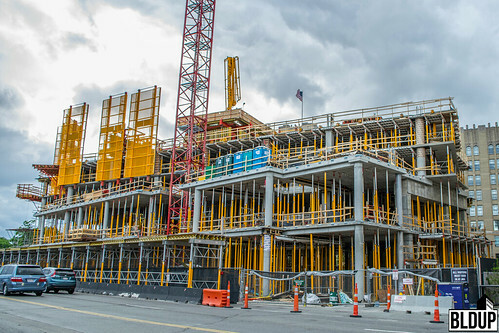 Inside Pierce Boston, metal stud walls continue to be framed to construct individual residences, and plumbing, electrical and HVAC systems continue to be installed. A pool that will become part of Pierce Boston’s exclusive top-floor Levity Lounge was recently lifted from ground level to the tower’s 30th floor. The pool has been carefully placed into the Lounge’s future pool deck. A video of the intricate pool installation process is posted below. Pierce Boston’s 109 distinctive luxury condominium residences, located on levels 19 through 29, are now on sale. 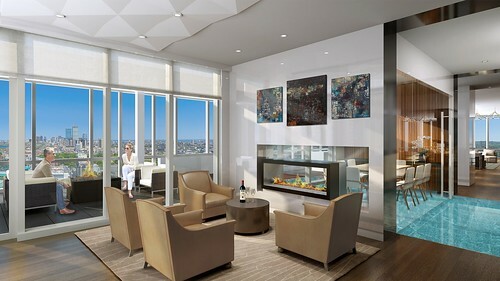 These residences will feature breathtaking panoramic views and state-of-the-art finishes. At Pierce Boston’s summit will be the Levity Lounge, an exclusive amenity space featuring private dining, a library, expansive outdoor and indoor seating areas with unprecedented views, a pool deck and private sky cabanas for purchase. Related Beal has announced that sales of the 157 new luxury condominium residences at Lovejoy Wharf will commence in April, with occupancy slated for Summer 2017. Sales are expected to start at $750,000, with residences ranging from studios to three-bedrooms. New details of condominium amenities at Lovejoy Wharf have been released; the latest details are posted above. Distinctive amenities at Lovejoy Wharf will include a landscaped 12th floor rooftop terrace with sweeping views, as well as 34-bottle wine coolers by Gaggenau and Kaldewei deep-soaking tubs in each residence. 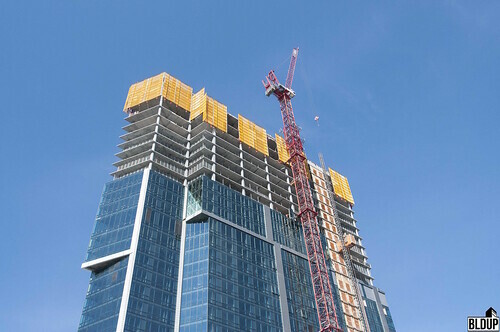 Exterior and interior finishing are well underway at the recently topped-out, 30-story luxury tower Pierce Boston. This architectural standout, designed by Arquitectonica, will serve as the gateway into the Fenway neighborhood. Pierce Boston will take its' place in the Boston skyline as the neighborhood's tallest luxury residential tower, offering a unique vantage point of the city and its' landmarks. 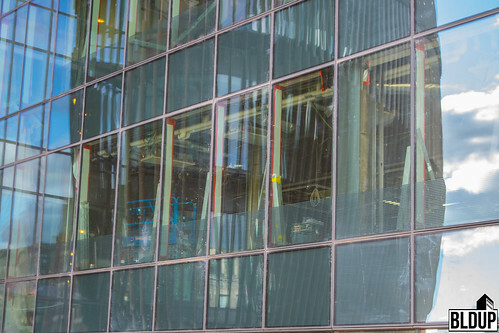 Unitized glass curtain wall panels are rising rapidly along Pierce Boston's façade and have already reached the 16th floor. 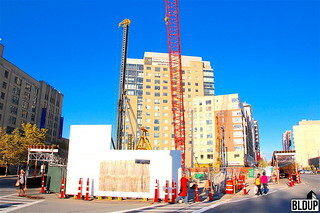 Inside, metal stud walls are being framed to construct individual units on Pierce Boston’s lower floors (1-18). These levels, beautifully designed by CBT Architects, will house 20,000 square feet of retail, impressive amenity spaces and 240 residential apartments. All floors of Pierce Boston are now being outfitted with plumbing, electrical and HVAC systems. 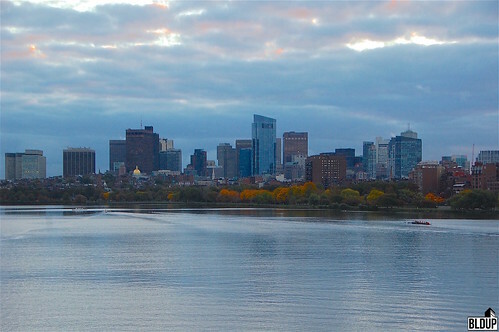 Pierce Boston’s 109 condominiums, located on floors 19-29, are now on sale and have breathtaking 360-degree uninterrupted views of the city, the Charles River, the Emerald Necklace and the Longwood Medical Area. Unique to new development in the city is Pierce Boston's condominiums' top floor amenity space, the Levity Lounge, featuring private dining, a library, expansive outdoor and indoor seating areas with unprecedented views, a pool deck and private sky cabanas for purchase. Dell Technologies Chairman & CEO Michael Dell closed yesterday (Tuesday, December 13th) on his acquisition of a penthouse condominium at the newly opened Millennium Tower in Downtown Crossing. 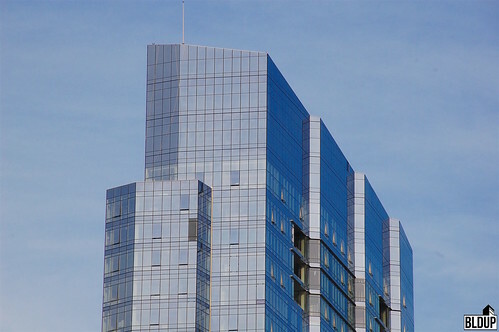 Dell acquired a 4,110 square foot penthouse on the 60-story building’s 59th floor featuring three bedrooms, four full bathrooms and one half bathroom for $10.9 million. Dell also acquired two parking spaces in Millennium Tower’s underground garage. Dell will live in the heart of Downtown Boston an elevator ride away from top-notch resident amenities and restaurants at Millennium Tower. Japanese seafood restaurant Pabu and a new Caffe Nero opened last month on Millennium Tower and the adjacent Burnham Building’s lower floors. 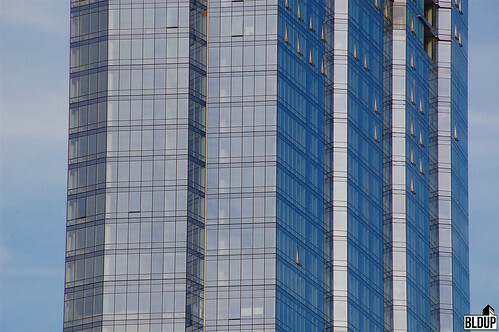 With Dell’s acquisition, sales of 401 Millennium Tower homes (91% of 442 total) have closed totaling $906 million. 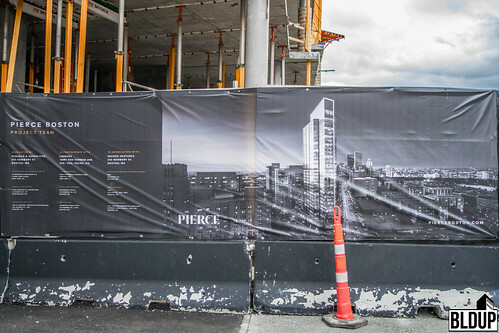 Pierce Boston has risen to nearly its’ full height, currently standing at about 28 stories tall. Pierce Boston will be a 30-story mixed-use tower. 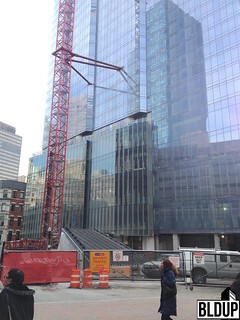 Glass has been installed along the first five stories of Pierce Boston’s facade. 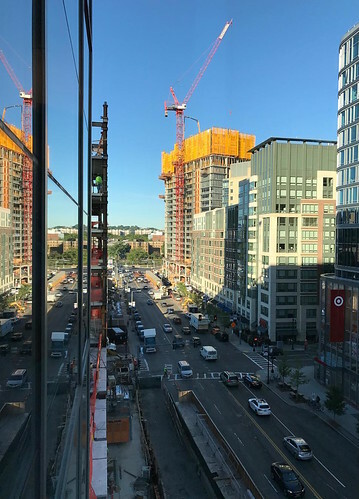 Hub25, a 278-apartment residential development located next to the JFK/UMass MBTA rapid transit station a short train ride to Downtown Boston, is now leasing. Rents range from just under $2,000 per month for a 469 square foot studio to just under $5,000 per month for a 1,152 square foot three-bedroom/two-bedroom unit. Studio rents range from roughly $2,000 to $2,300 per month. One-bedroom unit rents range from roughly $2,400 to $3,200 per month. Two-bedroom unit rents range from roughly $3,200 to $4,000 per month. The latest interior photographs of Hub25 can be found above. Visit Hub25Boston.com for more information. 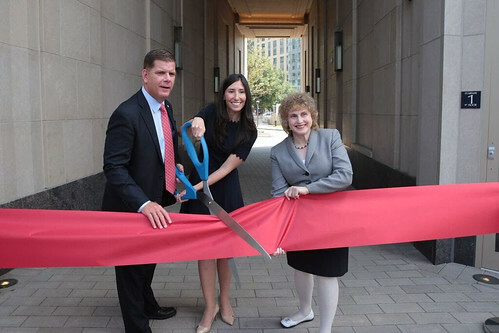 Millennium Tower is complete and has opened to residents. Sales of 373 condominiums (84% of 442 total) have closed for over $800 million. A Millennium Partners representative confirmed that Pabu, a Japanese seafood restaurant, will open at the tower on November 1st. Caffe Nero will open a cafe at Millennium Tower in mid-November, with Old Navy to follow in the first quarter of 2017. 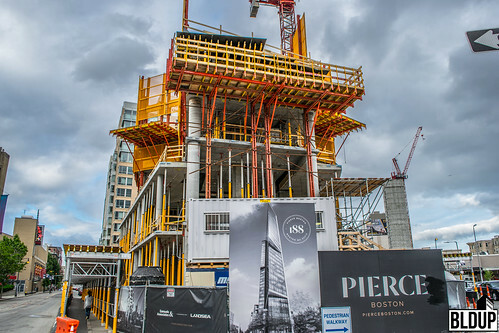 Pierce Boston, a 30-story luxury residential tower under construction in the Fenway, is over halfway to topping off. 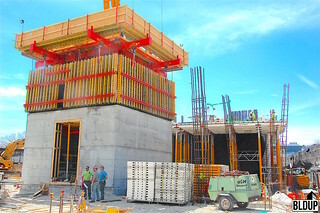 The tower's concrete structural frame currently stands at 18 stories tall. 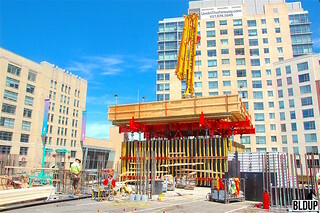 A PERI Skydeck system is being used to frame concrete pouring. 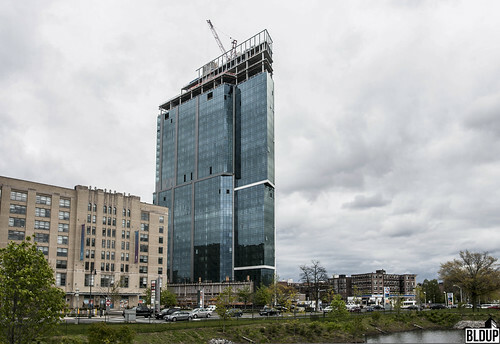 Per an update from the Pierce Boston team, the tower will soon receive its "brilliant costume" as exterior finishes, comprised of a "glimmering curtain wall made of metal and glass," are installed. Completion of Pierce Boston's facade is anticipated in Spring 2017; the tower is anticipated to open in Fall 2017. Residential apartments at Avalon North Station, a new 38-story mixed-use tower in Bulfinch Triangle, are now leasing. Rents and floor plans have been posted on the Avalon North Station website; rents will start at $2,270/month for studios, $2,595/month for one-bedrooms, $3,750/month for two-bedrooms and $5,435/month for three-bedrooms. Renters who sign a lease by September 30th will receive one month of rent free. An Avalon North Station leasing representative confirmed that the first move in at Avalon North Station is tentatively scheduled for November 3rd. 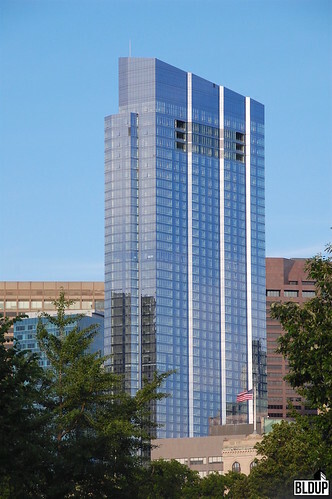 The Boston Globe reports that the first Millennium Tower residents are moving into the building today (Friday, July 15th, 2016). Workers were reportedly putting finishing touches on lower floors this week, with upper floors scheduled for completion later this year. Millennium Tower is reportedly 96% sold, with all but about 20 of the tower's 442 units accounted for. According to Richard Baumert of Millennium Partners, about 75% of Millennium Tower units were sold to Boston-area buyers. 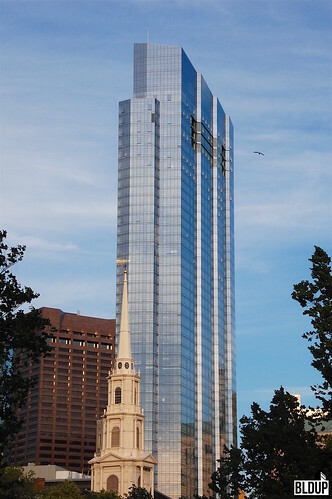 The first deeds for Millennium Tower unit sales were recorded Thursday, with closing prices ranging form $875,000 for a 16th floor unit to $8.7 million for a 45th floor unit. A total of 47 unit sales have closed as of Thursday. Buyers thus far include local executives as well as relatives of Harry Agganis, namesake of Boston University’s Agganis Arena. 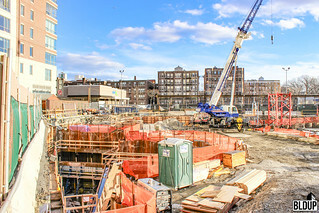 Superstructure construction is off to a strong start at Pierce Boston. 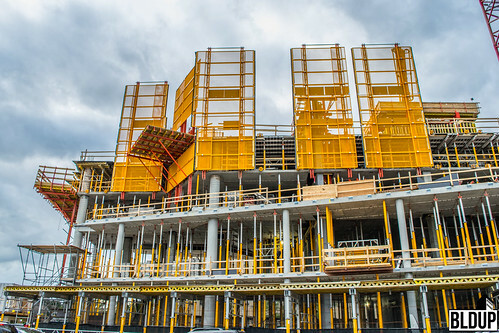 The underground parking structure is complete, and the tower’s 30-story concrete superstructure has risen four floors. The first two floors, which will contain retail space, are fully framed. 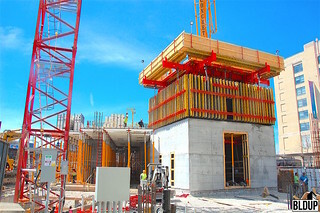 The construction team is using a Peri Skydeck system to frame concrete construction for each new floor. 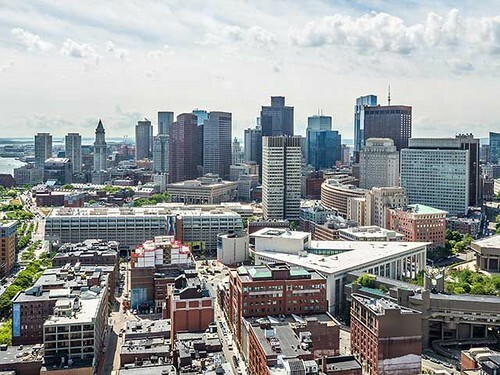 Pierce Boston will feature 28 stories of residential units, including 240 rental apartments and 109 condominiums, and 20,000 square feet of retail across the first two floors. Condominiums at Pierce Boston, which range from $1 million to over $6 million, are already 30% pre-sold. Visit the Pierce Boston website for more sales information. 12 rooftop cabanas at Pierce Boston ranging from 150 to 250 square feet are being offered for sale to condominium buyers at $300,000 to $350,000 each. More information about Pierce Boston is posted below. 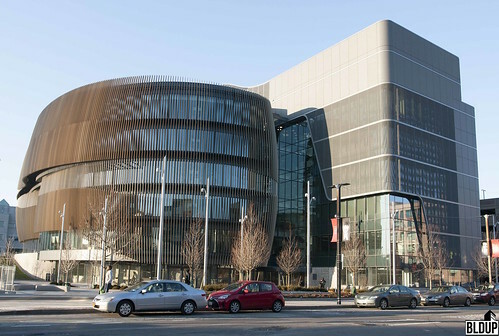 The exterior of Northeastern University’s new Interdisciplinary Science and Engineering Complex (ISEC) building is fully sealed with completed roof and window installations, as well as a unique sun screen along the facade. 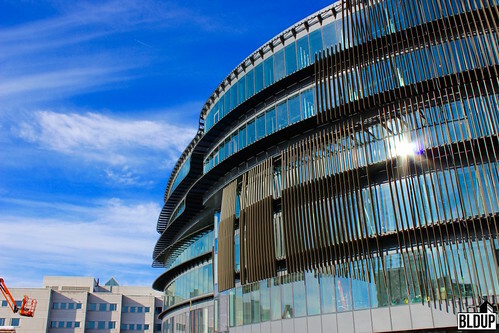 The array of vertical sun screening elements is installed to regulate the amount of sunlight that enters the building. Construction of electrical and mechanical systems, as well as interior finishes, is underway. 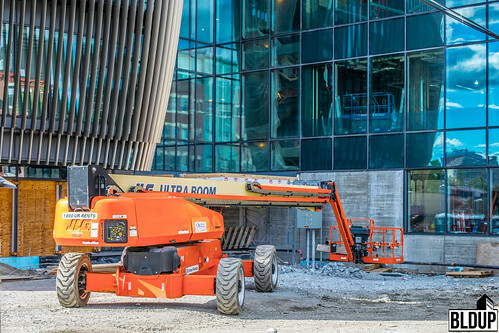 The construction team is targeting a fall 2016 opening for the ISEC in time for the 2016-2017 academic year. 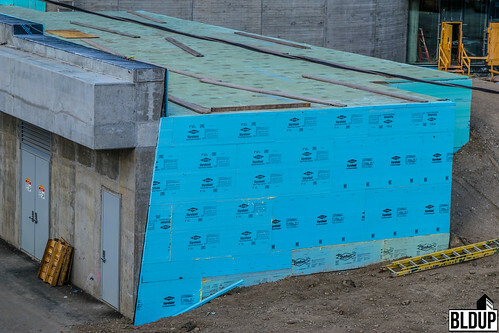 Installation of Dow Styrofoam Square Edge insulation (blue) is underway along the ISEC’s exterior. 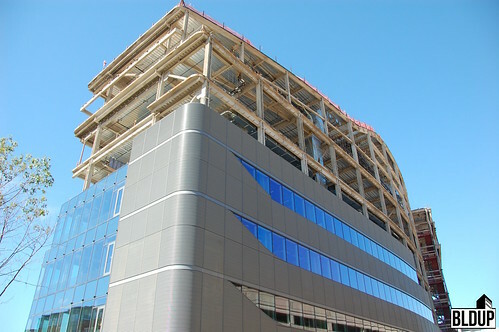 Square Edge insulation will help waterproof the ISEC’s foundation. 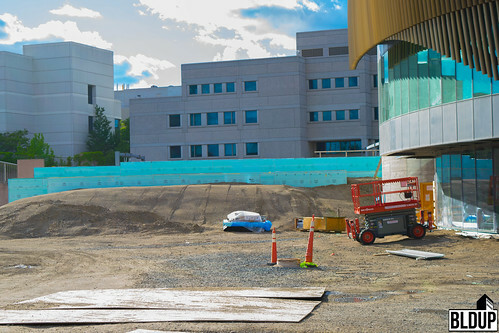 Next steps will include backfilling of earth along the ISEC’s foundation. Hardscaping and landscaping will follow. 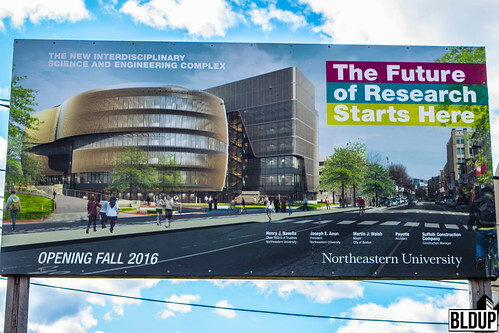 More information about the Interdisciplinary Science and Engineering Complex (ISEC) at Northeastern University is posted below. 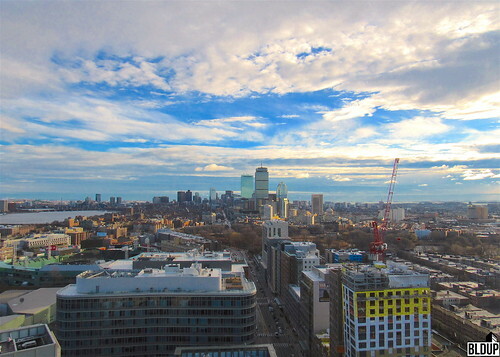 Pierce Boston, named for its architecture that "pierces" the sky, is rising fast! 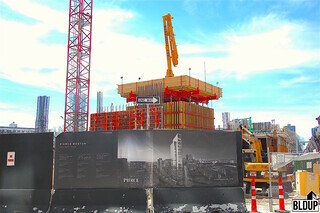 Construction of Pierce Boston’s 30-story frame has begun. 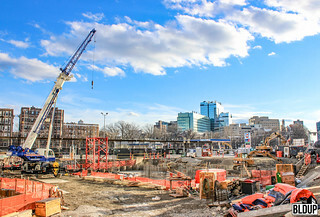 A tower crane has been installed; J. Derenzo Companies is at work building the tower crane’s lagging pit to protect the crane and surrounding pipelines. 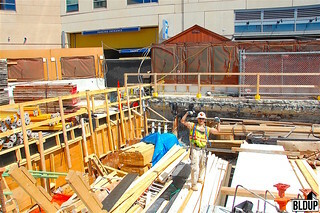 J. Derenzo Companies is also performing excavations for installation of plumbing at Pierce Boston. Pierce Boston’s elevator core has risen two stories. 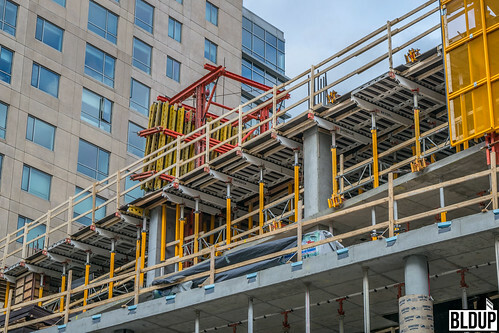 A Peri Skydeck formwork system has been installed along one end of Pierce Boston’s future frame to pour concrete for the building's second story. 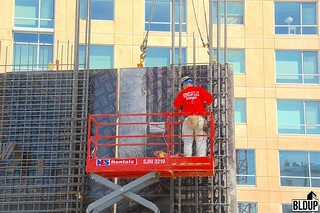 S&F Concrete is Pierce Boston's concrete contractor; John Moriarty & Associates is Pierce Boston's general contractor. 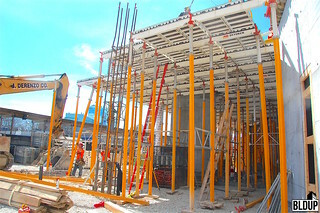 At the frame’s opposite end, a wall is under construction for the Peri system’s second half. 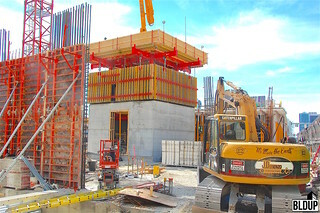 The Peri system will soon extend all the way to the wall, and concrete for Pierce Boston's second story will be poured. 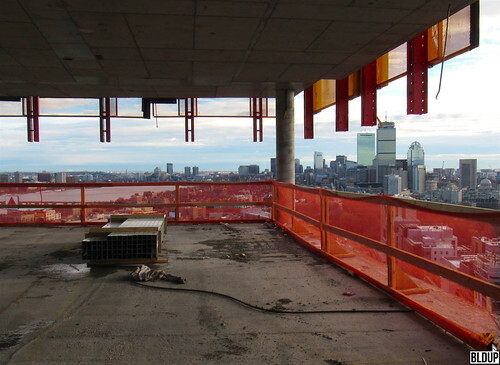 Once the concrete has settled, the same Peri system will be used to construct all 30 of Pierce Boston’s stories. 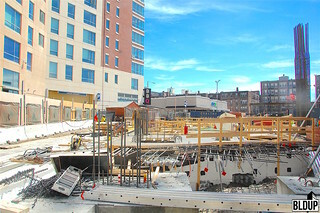 Concrete has already been poured along some of Pierce Boston's second story support pillars. View of Peri system underbody. 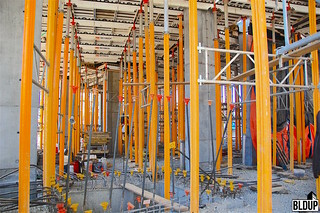 Note concrete anchors in place for pouring of support pillars. View of Peri system underbody. Concrete has been poured along some second story support pillars. We got to climb to the top of the Peri system's decking, where we saw the construction team preparing concrete anchors in anticipation of pouring concrete to construct Pierce Boston’s second story. These anchors will frame third story support pillars. 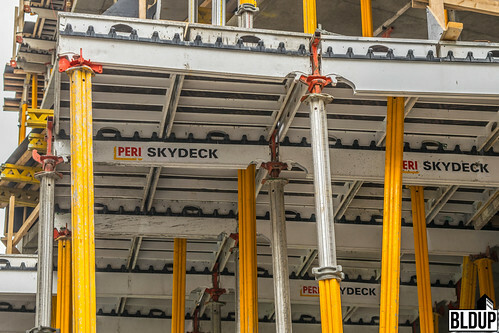 At the top, we found more Peri system decking panels that will be used to construct the full Peri system decking for Pierce Boston’s second story concrete pour. From the top of the Peri system decking, we saw freshly poured concrete along what will be a loading dock for Pierce Boston. Pierce Boston's underground parking structure, partially located beneath the future loading lock, is complete. 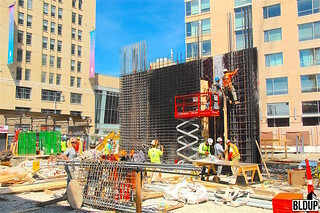 The Pierce Boston construction team is hard at work building a game-changing tower that will set a new standard for Boston luxury living. Additional information about Pierce Boston is posted below. 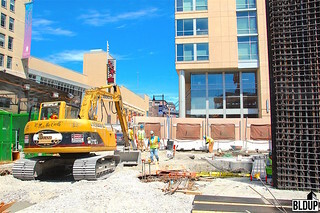 J. Derenzo Companies is performing excavations in preparation for construction of the first story of Pierce Boston’s 30-story frame. 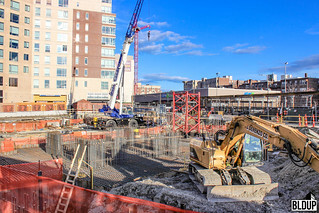 Concrete is just about to be poured at the base of Pierce Boston’s future elevator core. 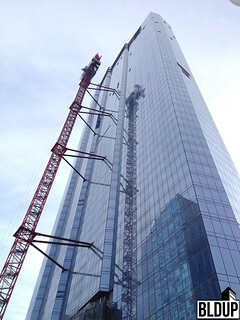 A tower crane is now being installed, signaling the impending start of frame construction. 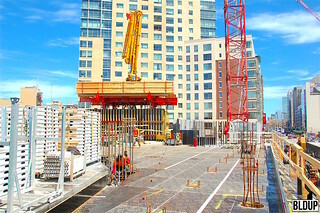 Pierce Boston's future elevator core ready for a concrete pour. In the background is the base of Pierce Boston's tower crane. Pierce Boston's underground parking structure is just about complete and will soon be sealed from above. Accordingly, construction of Pierce Boston's sheet pile wall is complete. 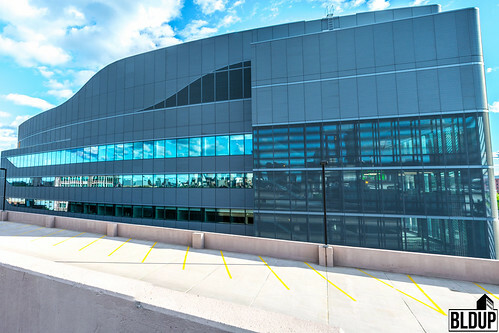 The parking structure is connected underground to the existing parking structure of neighboring Fenway Triangle. Pile driving is complete at Pierce Boston. 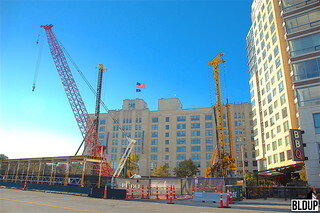 Pile drivers have been moved off site, making way for construction of Pierce Boston's frame. Millennium Partners' proposal submission for the Winthrop Square Garage redevelopment offers a glimpse at two exciting new retailers coming to Millennium Tower this year. Caffe Nero will reportedly open a second Downtown Crossing location at the tower. Old Navy will open a location at Millennium Tower as well. As previously announced, PABU, a Japanese restaurant, will open across two floors at Millennium Tower in fall 2016. Once these three retailers move in, Millennium Tower's 350,000 square feet of retail will be 100% occupied. In other news, Millennium Tower's 442 residential condominium units are reportedly 95% sold. Condominium sale closings will commence this summer in July. Related Beal's sale of the Hoffman Building, located on Lovejoy Wharf, to Union Investment of Germany closed Thursday. Recorded sale price is $150,000,001. Related Beal acquired the Hoffman Building, located at 160 North Washington Street, for $11,250,000 in 2012. The agreement for the sale was first reported in November 2015 by Banker and Tradesman. The Hoffman Building houses the headquarters of shoe manufacturer Converse and contains a total of 214,000 square feet of office space. 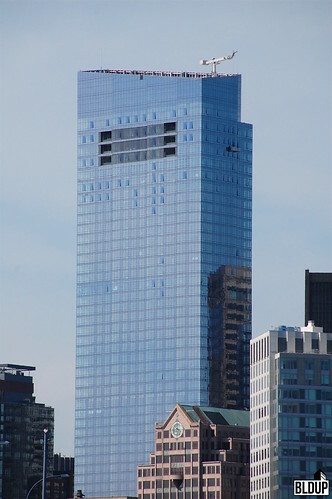 Related Beal remains the owner and developer of 131 Beverly Street, an under-construction condominium tower located on Lovejoy Wharf adjacent to the Hoffman Building. 131 Beverly Street will contain 162 residential units across 17 stories. Additional information about the Lovejoy Wharf project is posted below. 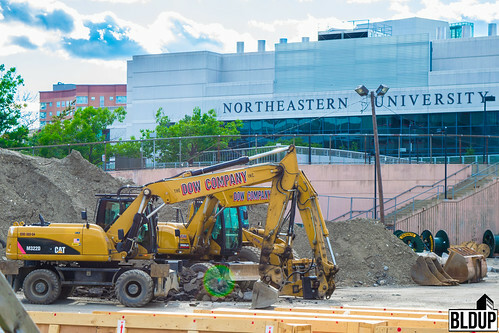 Finishing touches are being installed at Northeastern University's new Interdisciplinary Science and Engineering Complex (ISEC). 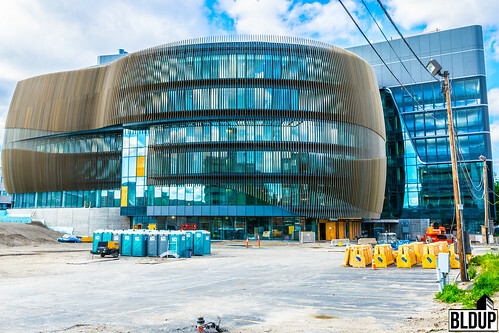 Glass has been fully installed along the ISEC, and the building's distinctive sunshades are beginning to stretch across the unique curved facade. The sunshades will create a flowing pattern that will have a significant presence along the Boston skyline and the Lower Roxbury streetscape. 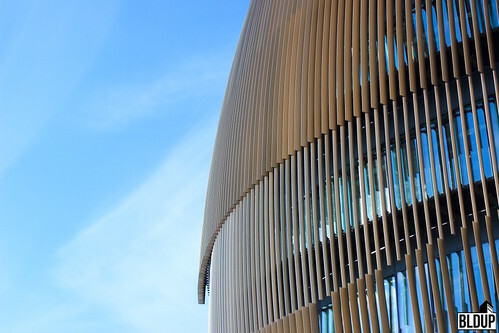 The flow of the ISEC's architecture speaks to the collaborative, innovative role the building will play on Northeastern's campus and in science and engineering research and education. To quote architect Payette, "movement defines the architecture, revealing a new culture of science at Northeastern that once existed in silos." 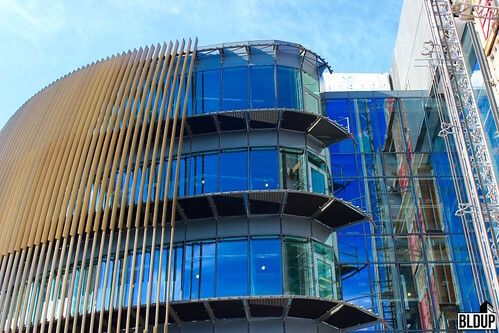 The ISEC will host researchers in a number of science and engineering fields, uniting both disciplines and encouraging collaboration. 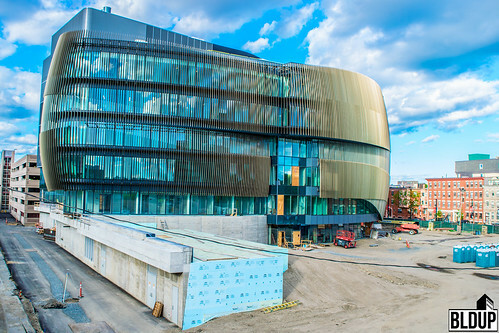 The ISEC is scheduled to open in fall 2016. The project is creating 600 construction jobs and is targeting Leadership in Energy and Environmental Design (LEED) Platinum status, the most prestigious LEED certification available. 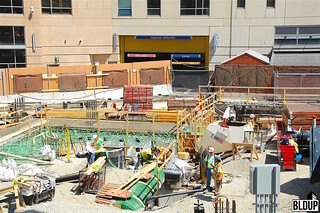 Pile driving and foundation construction are well underway at Pierce Boston. Steel piles are being driven to provide structural support. Sheet piles are being driven to construct a sheet pile wall. 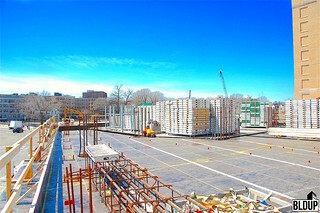 The sheet pile wall will reinforce Pierce Boston's foundation and underground parking structure. 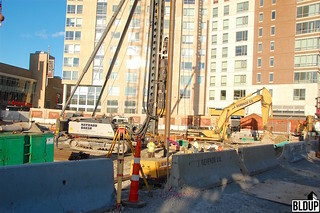 A total of 325 piles will be driven at Pierce Boston. 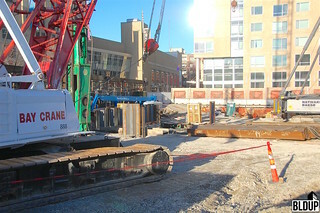 Sheet piles already driven along Pierce Boston's future sheet pile wall. At right are sheet piles about to be driven. 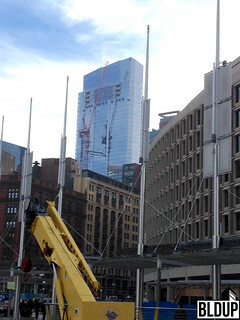 Millennium Tower's crane, Boston's tallest structure to date, is coming down as the building, built by Suffolk Construction, nears full completion! Glass is just about fully installed, and ground floors look ready for exciting new Downtown Crossing retail options. Brick finishes have been installed along much of 131 Beverly as the building moves closer to topping off! New photographs posted. 131 Beverly's frame is about to top off! New photographs posted. 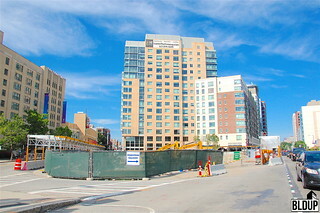 We visited under-construction 131 Beverly Street on Lovejoy Wharf. 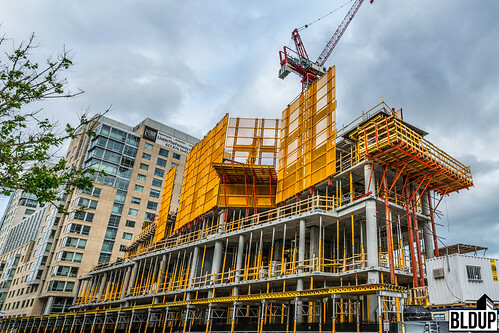 Consigli Construction is hard at work, and the building's core continues to rise. When complete, 131 Beverly Street will be 14 stories tall. 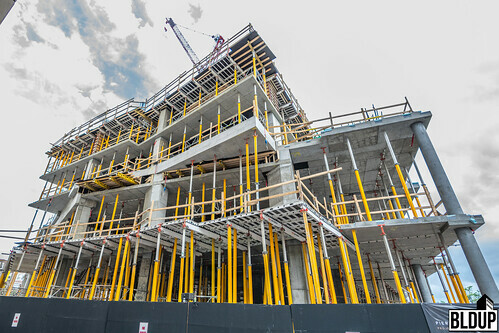 View our photographs of 131 Beverly Street above and learn more about the project below. 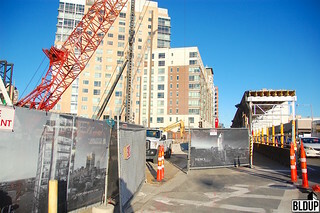 A live construction webcam has been installed at Pierce Boston. An official groundbreaking ceremony for Pierce Boston (formerly The Point) will be held this Thursday, October 15th, 2015. 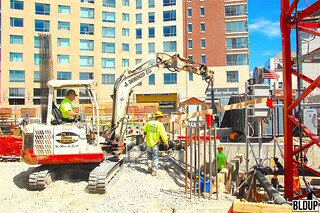 Construction of Pierce Boston is moving forward swiftly; pile driving and construction of Pierce Boston's foundation and underground parking structure has begun. 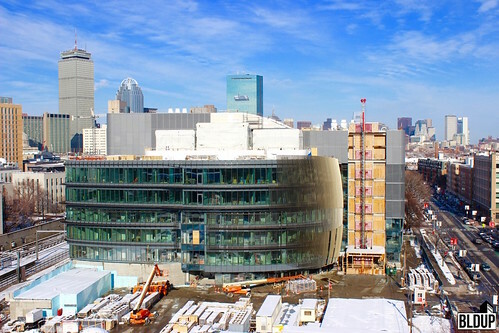 Exterior finish installation is underway at Northeastern University's new Interdisciplinary Science and Engineering Complex (ISEC). 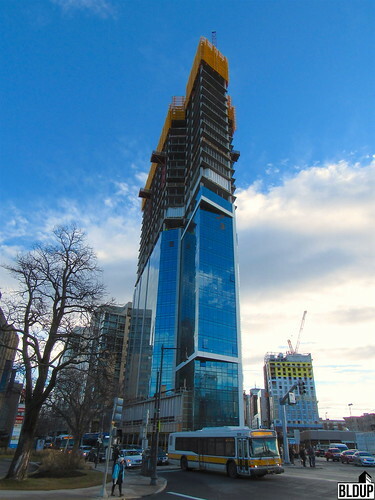 Finish panels and glass windows have been installed along much of the topped-off frame's facade. 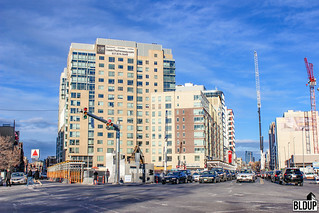 The Point, currently under construction in the Fenway, has been rebranded Pierce Boston. 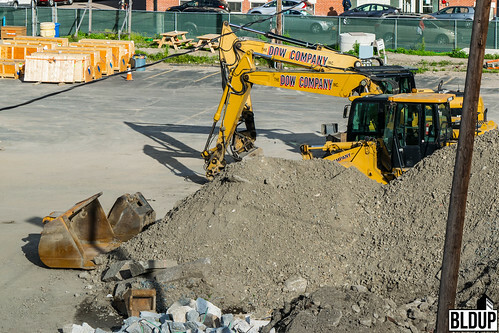 J. Derenzo Companies' JDC Demolition division has completed demolition of the former building located on the Point development site. Construction will soon begin on foundations of a new 30-story tower. Converse moved into its completed space at 160 North Washington Street in mid April 2015. 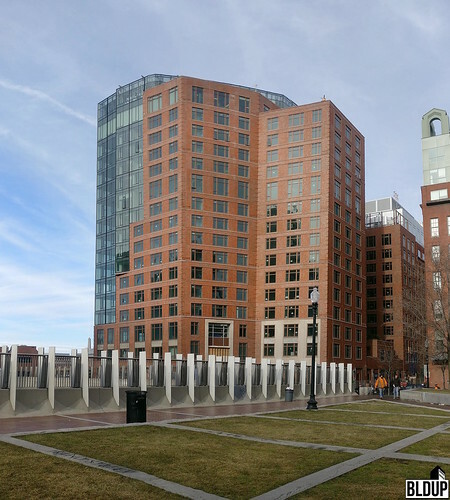 Soon afterwards, the new Harborwalk space on Lovejoy Wharf opened to the public. 131 Beverly Street broke ground in late April 2015 and is expected to be complete by spring 2017. Contact JM Electrical Company, Inc.